After a brief hiatus Tangerine Dreaming returns with a two part look at Blackpool’s start to life back in the Championship. This part will look at the season up to now and place it in a context and part two (coming later in the week) will take a look at the performances on the pitch seeking to understand the reasons behind Blackpool’s inconsistent form. When Blackpool fans were melting in the heat of Wembley stadium there was something of a mirage forming in front of their eyes. Twice coming from behind to secure a victory and their place in the Premier League seemed surreal. On reflection that season tends to be viewed with great fondness, particularly for that day at Wembley and an incredible performance against Nottingham Forest at the City Ground. However, when really breaking that season down it certainly wasn’t plain sailing and provides an interesting context that this season perhaps should be viewed. In reaching the play offs Blackpool racked up 70 points, finding the back of the net 74 times, which works out at a points per game average of 1.52 and a goals scored per game average of 1.61. 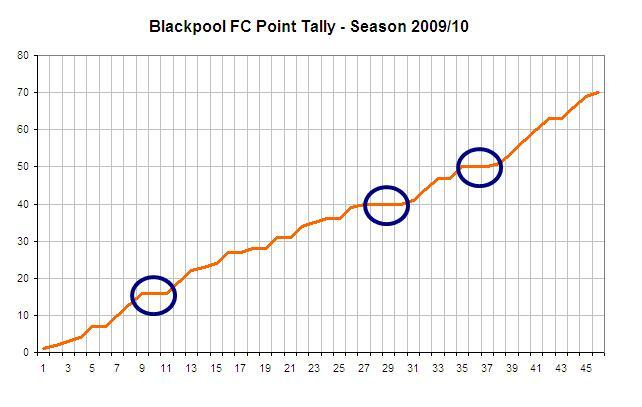 You can see on the chart above how Blackpool’s points accumulated over the course of the season. However, note how on three occasions the line went flat as they lost either back to back games or as in one instance, three consecutive games. This serves to demonstrate that over a season teams do have poor periods, but ultimately it’s how you recover from those upsets that determines how a team does by game 46. You can also see the step incline at the end of the season as the team pushed hard for the play-offs. Blackpool fans would no doubt like to see their team adjusting to life back in the Championship in a smooth fashion and riding high, it wasn’t like that last time around and with the loss of key players it’s not going to be like that this time around. Yes, the start Blackpool has had might strike the casual observer as odd, perhaps suggesting a hangover from the Premier League. Perhaps that is the case, but Blackpool are being rebuilt and that takes time. In his first season in charge it took Ian Holloway a considerable time to get his team functioning and this time around it may be the case again. Yes, an argument could be put together showing that he shouldn’t be in this position and that the club should have recruited in better time and funded a few more high profile signings. However, that wasn’t the case and Holloway has to play with what he has, adding loans where he can and hoping that he can land his main targets in the January transfer window. Just a quick glance at the teams from Ian Holloway’s first game in charge against QPR in August 2009 to the side who beat Cardiff in the final at Wembley shows how a side can evolve over the course of a Championship season. 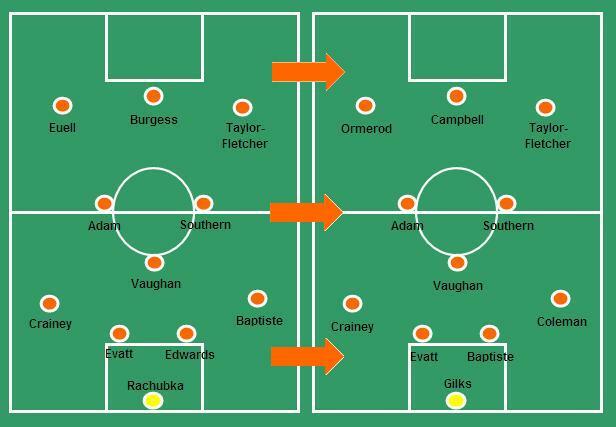 The side that played Holloway's first game in charge is on the left, set against the play off winning team on the right. That initial side (on the left above) had the nucleus of the team that ended up being promoted, however, four spots changed throughout the course of the season. Campbell came in to provide goals, Coleman with his attacking drive from full back, Ormerod with his intuitive running and instinctive timing and finally Matt Gilks who made the number one spot his own with his effective communication and shot stopping. 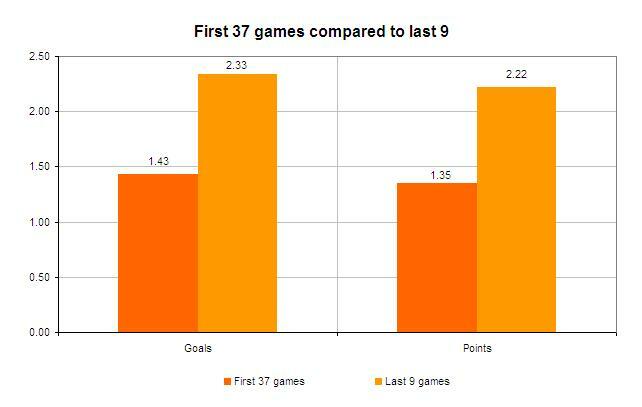 Blackpool’s last campaign saw the side develop over the course of the season and once the play off team was completed with the signing of Seamus Coleman from Everton the team went on a run over the last nine games of the season to secure their play off spot. Whilst this isn’t an ideal approach it gives hope as the season progresses and after every set back a quick glance across to the last time out will help to ease any worries. 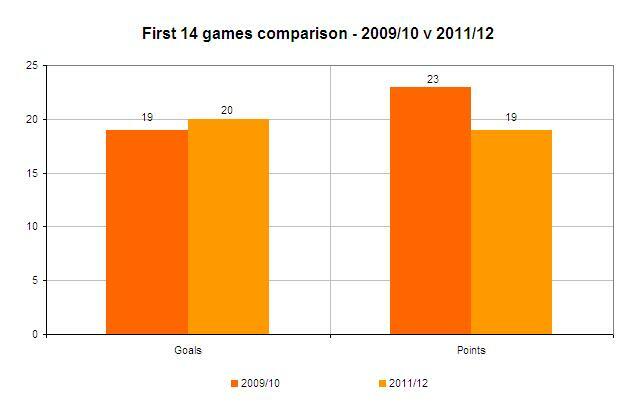 In fact before the play off side was completed Blackpool averaged 1.35 points per game and 1.43 goals per game. From the moment Coleman came in the points per game went up to 2.22 and goals per game jumped up to 2.33. Whilst this doesn’t offer a direct comparison it hopefully shows how a side evolves from beginning to end. This season is different and offers different challenges, but looking at the nucleus this time around Blackpool currently have around four spaces in their first eleven that are waiting to be taken. Those players are out there and may already be in the squad. It’s up to Holloway to find them and blend them; if he does it in a timely manner then Blackpool will be looking up. If not, then he may require a little more patience from the terraces as he looks to the following season for his new team to come to fruition. Finally, when looking at the first 14 games of this season against the last season in the Championship Blackpool really aren’t much worse off. Last time out they had 23 points on the board, scoring 19 goals. This time out (bolstered by a 5-0 rout of Bristol City) they’ve scored one more goal (20) but have 4 less points. When is a bad start not a bad start? Monitoring this season against that last Championship season may well be the best tonic for Blackpool supporters as well as the understanding that teams do evolve in this league. The length of season allows for mishaps and loss of form and the availability of loans allow teams to flex their personnel almost on a monthly basis should they wish. The comparisons made here aren’t flawless, but offer some guide, however, it’s always important to be mindful of what happened last season. Nottingham Forest grabbed sixth place with a total of 75 points, so Blackpool may well have to go further than last time they were here in order to get in to the play offs.